Written by Guest reviewer on Thursday, 29 September 2011. Ever wondered how effective the Traffic Light Food Label system would be? I asked dietitian and blogger Jemma O’Hanlon to review a new food label app to see if it was useful in making healthy food choices at the supermarket any easier. Here are her findings. After I heard that the Obesity Policy Coalition had launched their very own Traffic Light Food Tracker app I thought I’d better check it out. Normally I feel out of the loop when new iPhone apps come out as I have its competitor, the Android, but luckily for me this app is compatible with both. The best thing about this app is that it is user friendly and easy to operate. To rate any food, you simply key in the figures for total fat, saturated fat, sugar and sodium (from the Per 100g column on the nutrition information panel). For each nutrient you are provided with a colour rating, either green (for low), amber (for medium) or red (for high). You can also tap on each colour to find out more information about that nutrient. The app uses only one simple rule to rate foods - namely “the more green lights, the healthier the choice”. So what criteria do they use to assess each nutrient? We put three healthy foods to the test on this app to see how they rated and how they compared to our own view of them. 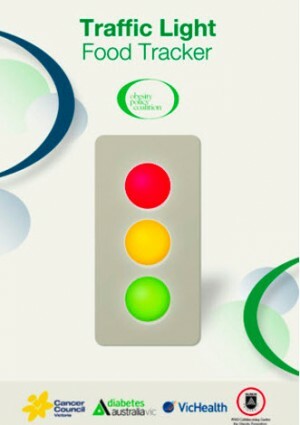 The app: Two red lights (fat and saturated fat) and 2 green lights (sugar and sodium). The dietitian: Olive oil is high in monounsaturated fat which is heart-protective. Two red lights and two green lights is misleading as olive oil is high in good fats and low in the bad (saturated) ones. All oils are high in total fat so this is not a good indicator of its health benefits. The app: One red (fat), two amber (saturated fat) and one green (sugar and sodium). The dietitian: An unsalted nut and seed mix is a top snack and eating a small handful a day has been linked with good weight management and heart health. Nuts and seeds help to keep you fuller for longer and are a rich source of dietary fibre. Like olive oil, the app provides an inaccurate assessment of this nutritious product. The dietitian: Eating a tub of yoghurt a day provides us with one third of our daily calcium intake and nutrients to strengthen our bones. Yoghurt has been known to play an important role in gut health due to the presence of good bacteria. These health benefits far outweigh the small amount of added sugar. The dietitian: LCM bars are made of refined puffed rice which gives them a high Glycemic Index and very little dietary fibre. These snacks offer little nutritional value, yet the app shows only one red and three amber lights as there’s no rating for the quality of the carbs nor the fibre. The dietitian: This rating surprised us as – given all the hate mail this cereal receives – we would have thought it would have rated much worse. It only scored one red thanks to its high sugar whilst being moderate (amber) in sat fat and sodium. The dietitian: With its first ingredient listed as sugar, the app correctly identifies this sweet biscuit as a poor nutritional choice. For once, we’re in agreement. This is one of the few foods to score three reds on the app - for fat, sat fat and sugar so it would fall down on most nutrition scores. Not many foods come out as poorly as this. On the surface, this app looks as if it’s giving you a good guide to the amounts of nasties in products. However its sole focus on these four ‘negative’ ingredients means it misses the wood for the trees. There are a number of important food factors that this app doesn’t include, such as the total kilojoules you can consume, the portion size you eat, fibre, Glycemic Index, total carbohydrates and added sugar (not the sum of the natural sugars AND any added). Not to mention important nutrients such as vitamins or minerals that we need for health. The app compares apples with oils, using it’s one set criteria for all foods, regardless of their category. In my opinion, you can’t compare apples with bread … or oil or muesli bars or nuts. As with the Choice review on mueslis (see my review here), foods with a higher total fat content will rate poorly, even if they contain good fats i.e. mono- and polyunsaturated fats. Examples of such foods are nuts, seeds and avocado which are associated with improved cholesterol profiles and a reduced risk of heart disease. Healthy foods like sweetened yoghurt or muesli containing dried fruit also rate poorly under sugar, because the app doesn’t distinguish between the naturally occurring sugars (like fructose from fruit and lactose from milk) and the added sugar that provides empty kilojoules and can contribute to weight gain. In addition, there’s no assessment for carbs that are whole grain, high fibre or low in GI. Every food is compared on a 100 gram basis. While this allows for a fair and equal comparison, it doesn’t let you judge foods that you consume in small quantities against foods eaten in big quantities. It’s easy to munch on a small 100 gram apple, for instance, but hard to get through 100 grams of margarine or oil. It's hard to fathom why they choose the low figure of 100mg not the accepted 120mg per 100g which is the official cut-off for a low-salt food. Can it help you eat better for health? Not really. Overall I commend the Obesity Policy Coalition for taking the initiative to develop a label reading app as a first draft. However, as we can see from the tests above, in its current form, the app misses out vital nutrition information and doesn’t tell the whole story about a food’s value. In fact in some cases, as we’ve shown, it is misleading. Jemma is the Senior Dietitian for Sodexo Australia and the Dietitian at Carman’s Fine Foods. You can read more of her article at her blog eat sleep dream love food. Product Review: Fruit straps - healthy snack or not?